Over Mountains on 5 Meters! The 5-meter band (56-64 MHz) allocated to U.S. amateur radio operations in the 1930s was reallocated in 1946 to television broadcasting. However, Hams still are permitted to operate on 6-meter (50-54 MHz) and 2-meter (144-146 MHz) bands on either side of 5 meters. Therefore, this article on non-line-of-sight communications within mountainous regions will still be of interest, even if only from a historical perspective. There is an interesting comment made about feeding a vertical 1/4-wave antenna from the top rather than from the bottom (with the entire structure located 50' above the ground). No explanation is offered as to the reason. Remarkable distances, considering the intervening mountainous country, have been covered on the 5-meter band as shown in the accompanying picture. The old question of whether or not communication on ultra high frequencies can be held between stations located in mountainous areas seems to have taken a backward step within the last few months. Scientists have claimed that ultra high frequencies are more or less quasi-optical - that is, the transmitting and receiving stations must be in optical sight of each other. Recently Dr. Marconi in an interview with the editors, stated that he had been successful in getting through mountainous areas on the ultra high frequencies but that he was unable to state whether or not the signals went over or through the mountains until further tests had been made. 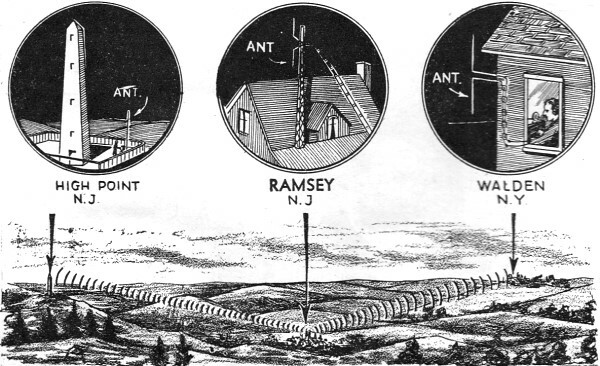 In the drawings, we have endeavored to show the readers the condition which exists between three stations namely portable W3AC at High Point Park, N.J., W2HBW at Walden, New York, and W2AMN (George W. Shuart) located in Ramsey, N. J. Perfect communication can be held at any time between W2AMN and either of the other two stations. 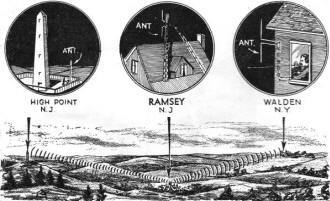 Several ranges of mountains existing between High Point Park and Ramsey have absolutely no effect on the signals W2AMN receiving an R8 report from High Point! Between W2HBW and W2AMN, there is located mountain ranges as high as 1500 feet and perfect communication can be held at any time, with an R6 report at either end. The transmitter at Walden is an M.O.P.A. using a matched-impedance antenna system for transmission and reception. 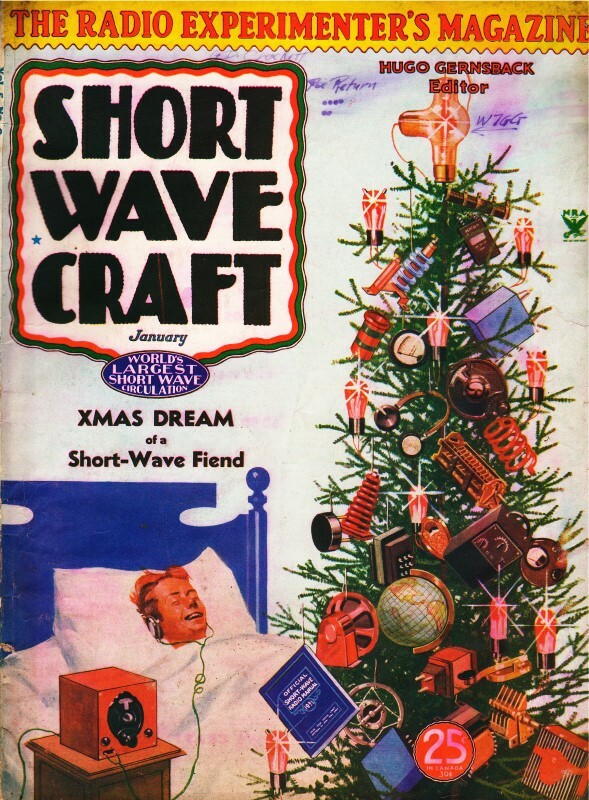 The transmitter at Ramsey is the same one that was described on the October issue of Short Wave Craft, using the "long lines." For reception a vertical 8-foot antenna is used, located some 50 feet above the ground, with the lead-in being taken from the top! The observations and test between the above three stations have proved absolutely that it is possible to "get through" mountainous areas, with ultra high frequency transmitters and with reliable communication. All work so far has been done on 5 meters, but in the near future higher frequencies will be tried to determine whether or not the same holds true.